Unless you base your fictional characters on people you know intimately – which can be tricky – it’s challenging to create characters that are both believable and unique. To solve the dilemma, writing instructors suggest various exercises – such as, making a list of things in your characters’ wastebasket. Or describing his or her living space. 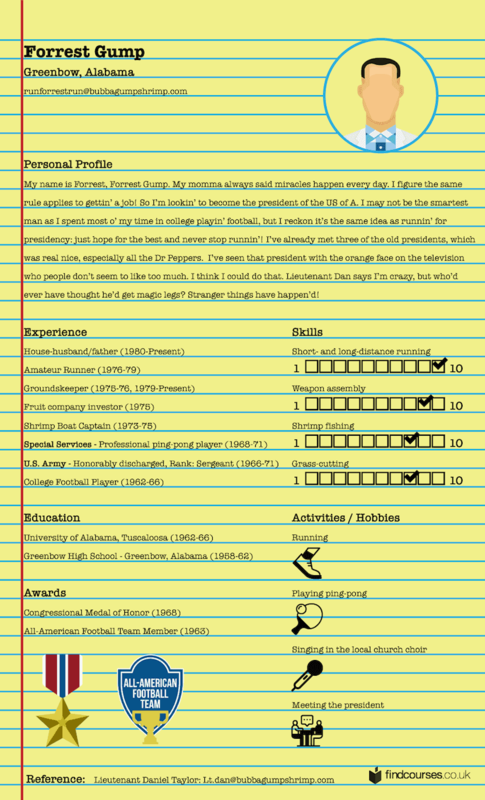 Or creating a detailed character profile. I’ve used all of these exercises many times, so I can vouch for the fact that they’re helpful. When I was developing my first novel, In Leah’s Wake, I was so stuck that I actually tried every last one. Before I’d written a word, I knew the origin and meaning of every character name, what each character ate for breakfast, the things that mattered and didn’t matter to them, the role religion played in their lives, their nicknames, their friends, and a whole assortment of other minutia that (thank goodness!) didn’t make it into the book, but helped me tremendously in figuring out who these people were, what motivated them, and why anybody should care. I don’t know about you, but I get bored using the same go-to exercises time and again. That’s why when Findcourses.co.uk sent us these CVs, we knew we had to share them with you. 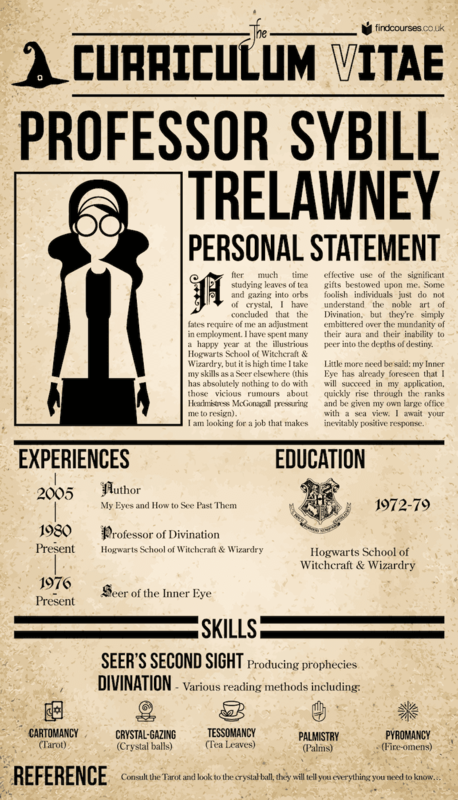 On the CV graphics, you’ll find resumes for classic characters, including Forrest Gump, Gandalf the White, and Sybill Trelawney. 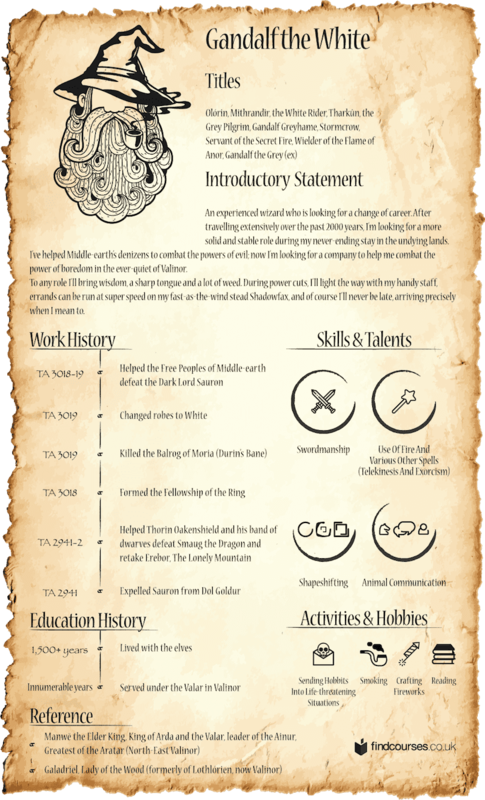 How do you think Gandalf, if pushed, would try to convince a potential employer to hire him? 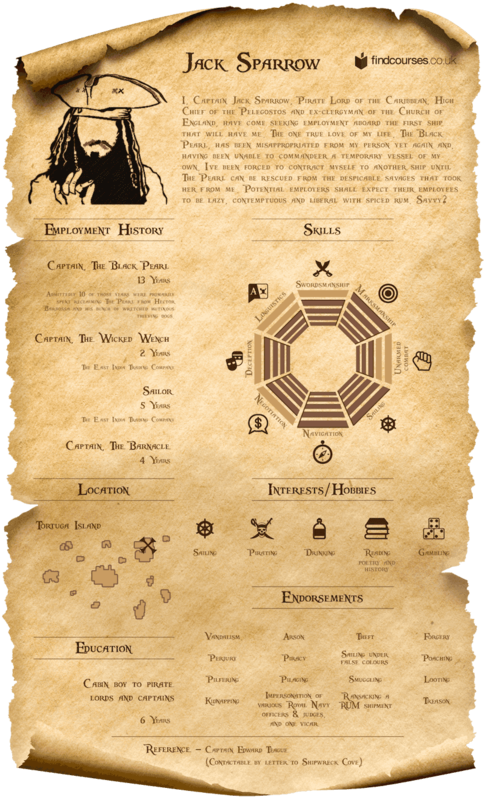 How would Jack Sparrow, Pirate of the Caribbean, explain his employment history? 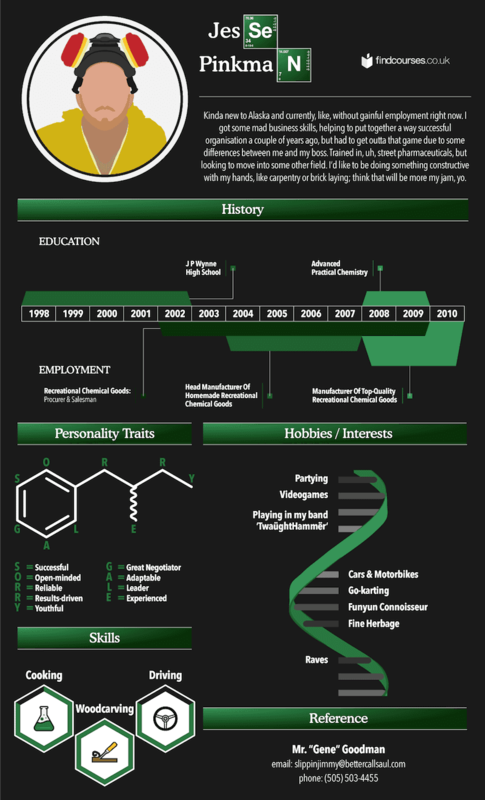 How would Jesse Pinkman reframe his meth-dealing escapades with Walter White to appear above board and legit? Take a look below to find out. 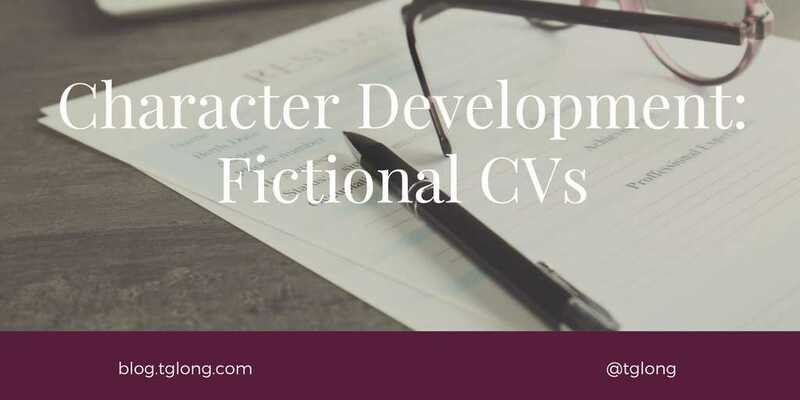 Then try your hand at creating CVs for your own characters, peopling your current W-I-P or maybe for a novel that’s still sorting itself out in your head. Have fun! We hope you enjoy!